THE HARVEST: A Scary Antidote To The Terminal Teen Romance – Schlockmania! The most morbid film trend to pop up in American cinema in the last few years could be called “the terminal teen romantic drama.” These films usually revolve a terminally ill teen who falls in love and teaches everyone around them to appreciate the wonder of life before croaking in time for the end credits to roll. It’s the kind of mawkish formula that begs for a cinematic response from more subversive-minded filmmaker – and The Harvest represents a response of sorts from the horror/thriller arena that cleverly subverts the themes of the terminal teen flick while delivering some unnerving, emotionally resonant thrills. The Harvest is built around the travails of two hard-luck kids. The first is Maryann (Natasha Calis), a young girl who is reeling from her parents’ death as she moves in with her kindly grandparents (Peter Fonda, Leslie Lyles). The other kid is Andy (Charlie Tahan), a young boy who is suffering from life-threatening illness that keeps him housebound. Maryann discovers that Andy is her next-door neighbor and tries to befriend him, only to meet resistance from his protective doctor mom Katherine (Samantha Morton). 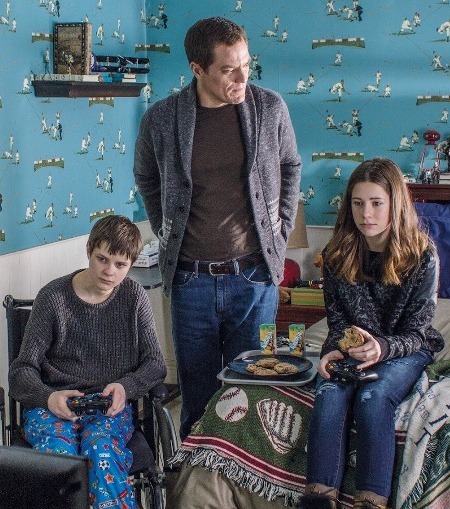 Even Andy’s withdrawn but kind father Richard (Michael Shannon) can’t help so Maryann begins to spy on the house to figure out a way to meet Andy in secret – and she discovers some terrible things about the family that push the story in a dangerous direction. The Harvest has little blood and a limited amount of violence but still packs a powerful wallop. This is mainly because Stephen Lancelloti’s script invests in characterization and takes its time to build up a touching, believable relationship between its two leads before getting into the thriller part of the plot. There is also a big plot twist/reveal at the midpoint that is devastatingly effective because it slowly unfurled before the viewer, with clues laid out in plain sight. Even the more Hollywood-ish thriller moments of the third act gain added resonance because they are underpinned by the depth of the villains. There are no “monsters” here: just people who have made terrible mistakes and do desperate things as they try to hang onto the dream of a happy life that is slipping away. Director John MacNaughton directs it all in a nicely understated manner, using Rachel Morrison’s cinematography to give the film a deceptive “family drama” look that amps up the creep factor and a similarly subtle score from George S. Clinton. Even the pace-conscious editing by DePalma film vet Bill Pankow is unobtrusive. That said, it’s the performances that are the key draw in The Harvest. Calis and Tahan are amongst the more believable teens in a teen-centric film of late: she hits the right mix of brash self-confidence and carefully-hidden vulnerability while he plays his character in a way that shows he is painfully aware of his limitations but determined to subtly comb at them. Morton shows an impressive range as a domineering character who can manipulate in bombastic or quiet ways while Shannon does beautifully subtle work as a man who lives in a state of constant self-repression. Fonda also steals a few scenes as a low-key but occasionally feisty parental figure. In short, The Harvest is a thriller that possesses a bracing effectiveness because it draws into a carefully built world: when a moment of suspense or violence hits, the audience truly feels it because they’ve been given the time to buy into the world it creates. It’s also the perfect antidote to terminal teen dramas, presenting that kind of life and death struggle in ways that have much more emotional depth. Blu-Ray Notes: This film was recently released on blu-ray by Scream Factory via their partnership with IFC Midnight. The transfer looks great, with a rich and varied color palette and similarly impressive levels of detail. Both 2.0 and 7.1 lossless stereo tracks are included for the film: the latter was used for this review and is immersive without overdoing the surround effects. McNaughton and producer Steven Jones provide a commentary track: it suffers from some dead spots and narration of what’s onscreen but patient listeners will get a variety of interesting nuts-and-bolts production tales and observations about the cast. The one other extra is a trailer. On this one, Don, I disagree with you. I enjoyed aspects of it and the performances, but what really killed it for me was the strident, obvious music score that felt like a producer’s effort to compensate for his zero confidence in the visuals. I actually liked how the grim secrets of the family contrasted with the clean, safe presentation of their world. Honestly, the music barely registered with me beyond that.